The Alaskan Malamute is a Nordic sled dog believed to have descended from the Arctic wolf and primitive working dogs. They were developed by a tribe of nomatic Innuits known as the Mahlemuts who needed a dog who could move their belongings from one food source to another. This type of lifestyle necessitated a dog strong enough to haul all of the tribe’s possessions and to transport goods to and from trading posts. These dogs were highly valued, as they were their only form of transportation. We have the car; they had their Malamutes! The Malamute is different from the Siberian Husky in that the Malamute is known for its strength while the Siberian Husky is known for its speed. Alaskan Malamutes were also known to hunt seal and even polar bears. They were used as service dogs in both World War I and World War II. 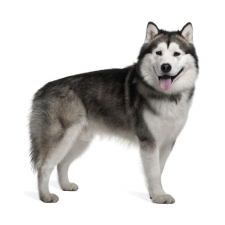 Alaskan Malamutes are friendly, loyal, affectionate, and completely devoted to their owner. They are known to get along well with children and other animals, but will generally show dominance over other dog breeds. The Alaskan Malamute is intelligent but can become easily bored if it has little mental or physical stimulation. It’s been said they can take a house apart faster than a rock star can trash a hotel room. They’ll need firm leadership and daily mental and physical exercise to avoid any destructive nuisances, as they are independent and can be stubborn. They are not good guard dogs as they are very friendly and would probably kiss anyone who might break into your house. They don’t bark; they howl! These dogs make wonderful family pets, as they are tireless, happy and like to run, play, and bound around a lot. They love being part of a family. The Alaskans Malamute usually weighs between 70 to 95 pounds and stands approximately 22 to 26 inches tall. Their body is slightly longer than it is tall. They are a large dog with a stocky and powerful build. They have a double coat which is thick and comes in a mix of shades, although their face is always white. Malamutes will talk to you. They have a variety of sounds that they can make and often “talk” at great length to their owner. They love to dig – A LOT. It is said that if you like to garden, you can kiss that hobby good-bye. Also, if they get bored, the Malamute will show their displeasure by howling and digging to the South Pole!